Fresh Off The Boat, like Cristela, addresses a family which isn’t your usual odd white one. This time around, it is an Asian – Taiwanese to be specific, family which isn’t dysfunctional, but certainly eccentric. Eddie (Hudson Yang) is the black sheep of his family, mostly because of his love for Nas, Biggie, and Tupac. Though he especially becomes an outsider when his family moves from the Chinatown in D.C. to Orlando, Florida. 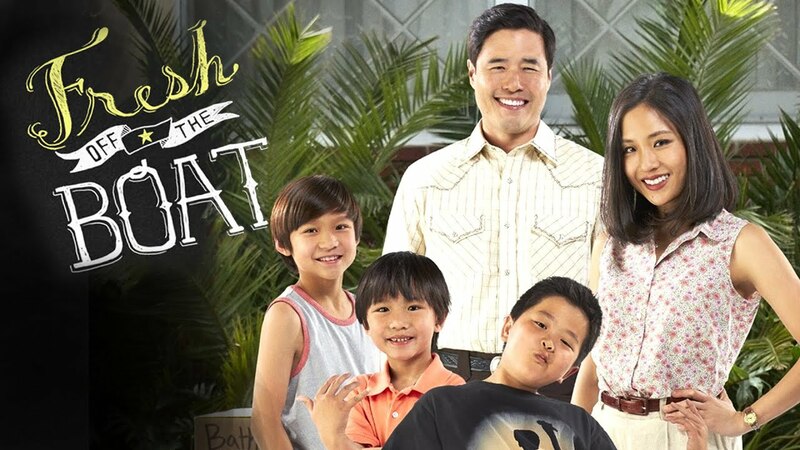 A place where he is the only Asian kid in his school, gets picked on because of the food his mom Jessica (Constance Wu) gives him and is trying to understand how his little brothers Emery (Forrest Wheeler) and Evan (Ian Chen) are having an easier time assimilating than him? He isn’t the only one having issues, though. His father Louis (Randall Park) is trying to start a mid-west restaurant and the restaurant is currently failing. However, despite the adjustment to the new surroundings being rough, even for Jessica when it comes to dealing with the stay at home moms, the Huang family looks out for each other. Including their little black sheep. What is likable about the premiere is that the main focus seemingly will be Eddie, and with that comes us getting to watch him learn how to adjust, grow as a person, and see the complexity of coming from a background in which the parents strongly want their children to adapt, yet not lose the culture they came from. Something which may or may not be shown in a complex way, but at the very least they do seem to want to approach racial relations in a more comical, and less in your face, way than Cristela. For while the word “Chink” is used, and Eddie gets picked on due to his birth name and the meals his mom makes, it is more micro-aggressions than something which seeks to be outright provocative. Another thing worth noting is that unlike many families on TV, we are given the idea that even if there isn’t a 100% understanding of each other, the love and bonds of each character eventually lead to acceptance. To the point where anytime there is fussing or battles staged, you can tell it is because they are looking for the best out of each other vs. fighting for comedic effect or simply for the sake of insulting one another. Outside of the show using the very familiar family formula of one black sheep, and two parents of which the dad is optimistic and silly and the mom almost a complete opposite, there isn’t much to critique here. I mean, I will admit this wasn’t as funny as I hoped it would be, but I did get a few chuckles in. Though I must note, sometimes I felt a little uncomfortable laughing since I wasn’t sure if I was laughing at a stereotype or something the writers/ actors intended for me to laugh at. Like many programs which basically race/ culture swap, a lot of Fresh Off The Boat will seem very familiar. However, with it having the spin of a Taiwanese family, and there not being an Asian family sitcom on TV since the 90s, you can’t blame them for setting a safe, and familiar, foundation before they branch off to be unique. Which this show very well could be. For between it being comfortable, so it seems, with poking fun at the culture of Eddie and his family, while being proud of it; being in this weird space of wanting to assimilate, yet keep their culture alive within them and the children; and then with Eddie growing up before our eyes, one could only hope that the general lack of famous Asian talent in Hollywood could be slightly less once this show ends. Hopefully many seasons down the road. I’m fully aware this is based on a true story, but we all know being “Based On a True Story” doesn’t mean they won’t embellish the hell out of things for the sake of making them entertaining.